Ramentic brings the narrow, small-noodle bar vibe of Tokyo and puts a Braddon twist on it, offering a range of ramen with different broth bases. I tried the Ramentic ($18), with the tonkotsu broth, chashu pork belly, mushrooms, bamboo, spring onion, mushrooms and takana mustard leaves, and added an egg ($3). Arrive early – Canberra loves a trendy food, and there are long queues at peak mealtimes. There are still some ‘newly opened restaurant’ hiccups (kitchen dockets not printing, register issues), but the staff handled them well and a short wait after ordering my ramen arrived, so I was happy! The broth was buttery, rich and filling, although it was rather runny, and didn’t have the depth of flavour I’d hoped for. But the toppings helped, especially the mushrooms and takana (the little bit of spice was delightful). There were three thin pieces of fatty pork, which were tender, but I found the noodles to be rather thin, and they clumped together. I do have high expectations of ramen, and love that we can get it here, but I’d hoped for a little more authenticity. I’m keen to go back and try another broth for sure though. 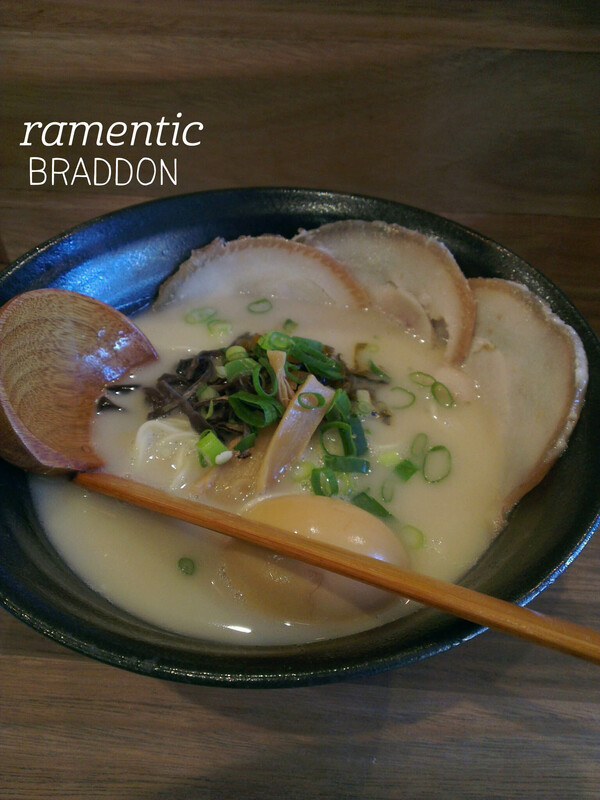 This entry was posted in Canberra and tagged Canberra, Japanese, noodle soup, ramen. Bookmark the permalink.